120 Days Same as Cash $624.00 - We make says Yes our goal. 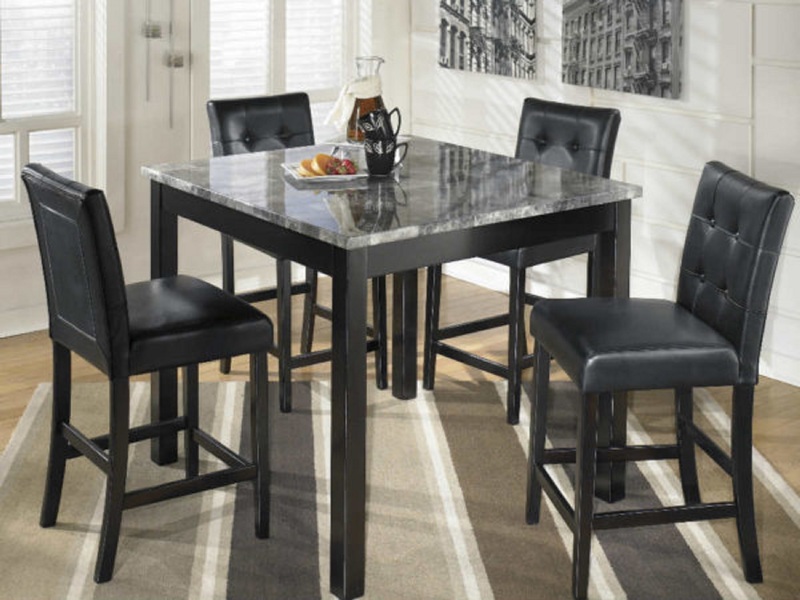 The square shape of the Ashley D154-223 Maysville Square Pub Table Set offers comfortable dining without taking up too much space. Faux marble tabletop has a polished look that’s easy to clean. Cushioned counter stools are tufted and covered in faux leather and slide neatly under the table when not in use. Shop Ashley D154-223 Maysville Square Pub Table Set in Myrtle Beach, North Myrtle Beach, Conway, Murrells Inlet, Carolina Forest, Surfside Beach, Garden City, Little River, Longs, and Pawleys Island South Carolina. Ashley Furniture has become the #1 selling furniture brand in North America by following the four cornerstones, namely, Quality, Style, Selection, and Service. It is their everlasting endeavour to become the best furniture company. Founded in 1945, the headquarters in Arcadia, WI continue to be the most important manufacturing and distribution facility, Ashley Furniture has many other distribution and production facilities throughout the US. Back in the starting years, they specialized in occasional tables and wall systems. With consistent efforts and innovative manufacturing strategies, Ashley Furniture has become the largest home furniture manufacturing company. They incorporates innovative marketing concepts, quality products and state-of-the-art manufacturing methods to realize 100% customer satisfaction. With one of the latest and largest fleet of trucks, Ashley Furniture is able to deliver across country in just days. Ashley Furniture offers a wide range of products in virtually every home furniture categories from bedrooms to mattresses to home office, and in pretty much every style from contemporary to traditional. While much of the manufacturing is done right here in the US, some of the cased goods products like some dining and bedroom collections are imported from around the world. The company is composed of three separate operating divisions, namely, Ashley Casegoods, Ashley Upholstery and Millennium.